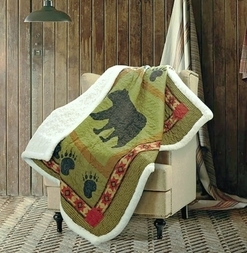 Featuring a large black bear surrounded by paw prints on a sage green background, and accented with a southwestern border. Reverses to a luxuriously soft sherpa fabric. This throw would be a wonderful accent to your favorite chair.